If you like Jeffers' The Heart and the Bottle (Check out our review here), you may enjoy this one too. It's a similar message but on a larger, more insightful scale. A Monster Calls is a deep and beautiful tale which I almost didn't read because of the title and cover; I tend to shy away from "scary" stories and not really knowing anything about the book, from the looks of the cover and title, I wasn't sure if I wanted to read it. Well, the title describes it perfectly and yet it does not. And the story is scary and yet it isn't. This is one story that I hesitant to share too much about because the story is so beautifully written and the themes so true. Everyone can relate because we all have monsters. We may not all be in Connor's specific story, but we all share similar stories of sadness, pain, fear, and truth. It's a story both sweet and bitter. Overall, such a deep deep reflection on the fragility of our souls and the healing power of truth. Note: Patrick Ness took inspiration for this story from Siobhan Dowd, who recently passed away. I appreciated that the story was written by Ness and not a mimic of Dowd's writing. It makes it more real this way. 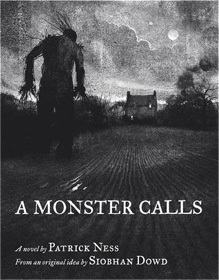 A Monster Calls is available now on Amazon. Great review! I loved Patrick's trilogy that starts with The Knife of Never Letting Go and was wondering about this book. Glad to read that you liked it so much and gave it a 5! I have it on my Kindle so now I'll have to bump it up on the TBR list! @Suz-I hope you like it! Let me know what you think when you're finished! I haven't read any of Patrick's other books so I'll have to try them. Thanks for the info!